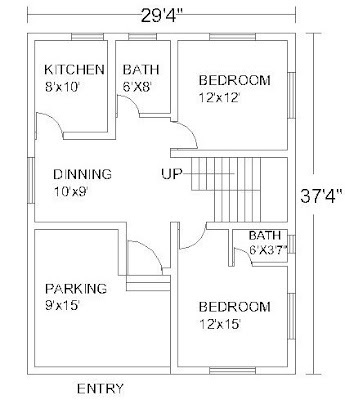 This house plan consist of two bedroom, one kitchen, two bathroom (one common and one attached with bedroom), one dinning hall, one garage and one staircase built in an area of (29'4"x37'4") 1098 sq. ft. This house plan has open parking at the entrance along with an entry to the inside of the house. It has staircase in the middle of the house between two bedrooms and a dinning hall opposite to the staircase. One bedroom is provided with an attached bathroom so it can be used as a guest room whenever required to give them more privacy. 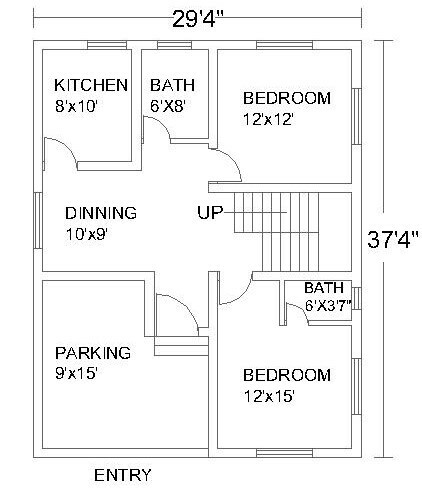 This house plan will work best for a small family. Depth : 37'4" Width : 29'4"
Type : Half-turn Trade : 3'6"
No. of Steps : 20 Riser : 6"